I have to admit, when I started to watch Drillbit Taylor, I wasn’t expecting much. I am always wary of movies that ride the coattails of a film director’s previous success, in this Judd Apatow (who serves as a producer for this film). In this case though, I am happy to report that Drillbit Taylor is a rather pleasant surprise, thanks to the cast and their chemistry. High School freshmen Wade and Ryan (Nate Hartley and Troy Gentile) try their best to “reinvent” themselves for the new school but things don’t turn out so good. First, they come to school in the same shirt and when Wade sticks his neck to aid a fellow school from a pair of bullies, things go from bad to worst. When the bullying becomes too much to bear, Wade decides to place an ad online seeking the help of a professional bodyguard. 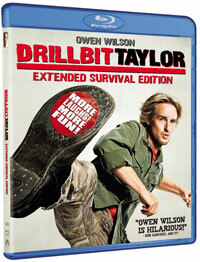 What they get is Drillbit Taylor (Owen Wilson), a former man of the military and now a homeless man. Using the gullible kids as cash cows at first, Taylor grows fond of the boys and tries to help them face the bullies head on.